thankful for and I’m sure that you do too. One thing we all share is the enjoyment of collecting. I know what’s on my Christmas list, I hope you have prepared yours as well. I also really enjoy receiving the ‘Ask Don’ emails. PCGS is doing so much that it is easy for some things to be unclear. The questions and issues brought up in the emails give me a chance to focus on a specific issue. I think it’s great so please keep the emails coming. Which coin alloy do you find the most attractive? Participate in the PCGS Newsletter Survey and you could win a 1986-P 50C graded PCGS BU valued at $8.00. Every year brings its share of numismatic price records and surprising realizations at auction. Perhaps the outstanding example from 2013 is the gem 1880 Coiled Hair Stella sold by Bonham's in September for a record shattering $2.57 million. Prior to that auction, no Stella had ever brought over $1 million. Here's a closer look at one of the most famous and desirable of all U.S. Pattern Coins. One of the most useful tools on the PCGS website is the Auction Prices Realized. This mountain of data is a compilation of all major auction sales since the early 1990s, including everything from common coins in great condition to super-rarities that only appear once every generation. In general, most experts and users of this information believe that auction sales represent the fairest and most accurate pricing data available. Read how to leverage this data to your advantage, whether buying or selling coins. Since its inception, the United States Mint has used many different metal alloys to produce coins. This variety has given collectors many more options when collecting, and at the same time, made coin collecting much more exciting. Jaime Hernandez explores the alloys used by the U.S. Mint and asks you to name your favorite. As an added perk PCGS Members Only Show in December, Legend-Morphy Rare Coin Auctions is headed back to The Venetian/Palazzo in Las Vegas for their fifth Regency Auction. The Auction will begin December 19th at 6:00 PM and will feature Phil Flannagan’s Territorial Collection. 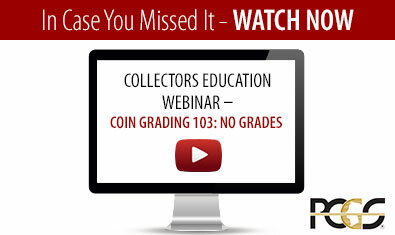 We’re excited to announce that PCGS’ next webinar is only days away – this coming Thursday at 11 AM PST. You won’t want to miss this important topic – Counterfeit Detection – as it can save you needless headaches when looking to purchase coins. The webinar will be hosted by PCGS Director of Education, Mike Sherman, and is 100% free to attend. I hope to see you online!